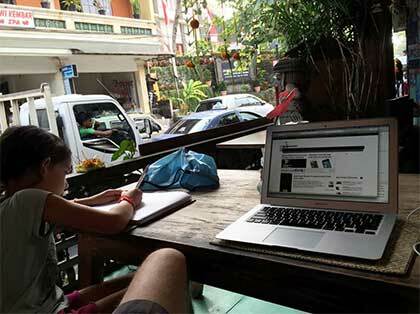 Ben Brooks recently penned a great post about working from home. In that post, he mentions: “as a remote worker, it is hard not to imagine all the amazing, cool places you could work from…”. My family decided to test that out this summer with an extended trip touring Southeast Asia. We spent two-and-a-half months touring Taiwan, Vietnam, Cambodia, Malaysia, Indonesia, and Singapore. With that much time away and a client’s iOS app project nearing completion, I needed to be able to work effectively during the trip and still do things like visit ancient temples, go spelunking, watch giant sea turtles lay eggs, check out a world music festival, see wild orangutans and proboscis monkeys, and learn how to shoot a blow dart like a headhunter. This presented some unique challenges. My main work machine in my office is a 2008-era Mac Pro with 10GB of RAM and a 23-inch monitor. On the road, I typically carry a 13” MacBook Air, which works well for minor coding needs during conferences or relatively short client visits. While I could probably come close to my Mac Pro’s performance with a new MacBook Pro, I didn’t want to buy a new computer just for the trip. So, I decided to make the MacBook Air work. Since most of my work is in Xcode, with Slack for communication and Safari for issue tracking and pull requests, I like to have a little more screen real estate than the MacBook Air provides. To address that need I brought along an iPad Air. Depending on the day or the need, I could use the iPad separately to access Slack or Safari, or I could connect it to my MacBook Air using the app Duet to use it as a second screen. I brought along my main daily-use phone (iPhone 6+) to help with navigation and serve as a test device and a personal hotspot. My mobile provider at home is T-Mobile, which includes unlimited data and text for international roaming in 120 countries. In addition I brought along a 5th generation iPod touch and an iPhone 4S for testing. With all those devices comes a lot of cables. I packaged the cables into two mesh bags to keep them from turning into a tangled mess: one for device cables and power adaptors, and one for laptop power adaptors and cables. I brought along two Travel Smart international power adaptors as well, which I definitely needed in Malaysia, Indonesia and Singapore. My plan for connectivity was to use hotel (or cafe) wifi as my primary method of connection, and then my phone as a personal hotspot in a pinch. In practice, that didn’t really work out most of the time. Hotel wifi was generally tricky - in some cases it worked just great, but most of the time it was spotty in the room and when it did work it was pretty slow. So, I used my phone as a hotspot pretty frequently, and did work offline and then connected when I needed to for tests or pushing up code. Lucky for me my iPhone 6+ is on T-Mobile, which provides unlimited data roaming. I have to say, it was absolutely fantastic. There is a catch - the free data they provide is at a limited speed, but it worked great everywhere but Vietnam. Data at faster speeds is available to buy, but I was able to get everything to work using the free data and a little patience. It was really convenient to get off the plane, bus, or boat in a new country and have my phone just work. Most of the countries we visited make it easy to buy a cheap SIM card for some data; but it’s an extra step that I was glad I didn’t have to do every time. In Vietnam T-Mobile’s roaming service did not work, so I just bought a SIM card with 10GB for the equivalent of US$10 and put that in my iPhone 6+. If you are planning to try that approach, note that your device must be unlocked in order for that to work. T-Mobile iPhones are typically unlocked by default now, but AT&T, Verizon and Sprint iPhones are typically locked to the carrier and must be unlocked by them. For calls, I was able to use Skype and GoToMeeting very effectively. It was surprising to me how well they both worked considering the often slow networks I was on. 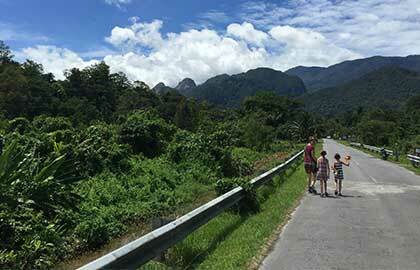 The only place we visited where connectivity was really difficult was the spectacular Mulu National Park in Borneo. The mobile phone service there didn’t have a workable data connection, and the only wifi available in the park was over a slow satellite connection, so I could only get email to work. It was a good opportunity to really set work aside and fully enjoy the natural beauty of the park. Some places just shouldn’t have good internet connections. One of the most difficult things for me was finding a good space to work. At home, I have an office set up with a desk, and a window for light, and a door I can close if it gets too noisy in the house. 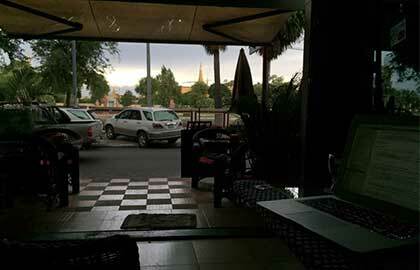 To meet our travel budget, we stayed in some pretty inexpensive places. It was amazing that we could get a hotel for the equivalent of US$20, and if we really went crazy it would cost US$50. But the hotels in those price points typically did not have a desk with a chair and power outlet like you might find commonly in the US. So, I would either have to lounge on the bed to work (and risk falling asleep since I worked frequently at night!) or go somewhere else. 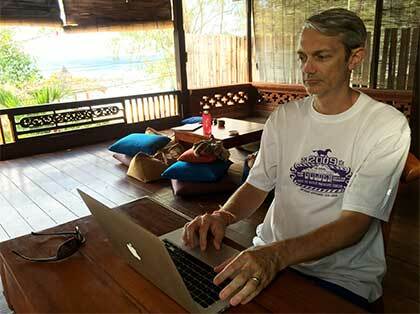 In a few cases the hotels had common areas where I could sit and work, but that was the exception more than the rule. 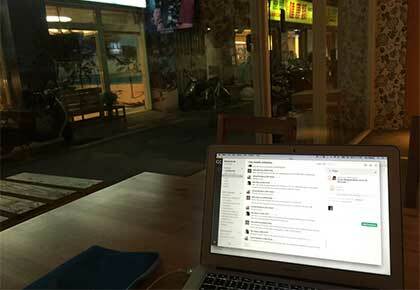 In many cases I needed to go to a cafe, restaurant, or even a bar to find a place to work. One evening I worked out of a bar called the Ace of Spades run by a British expat in Borneo - and it was as colorful as it sounds. Searching out work locations ended up being a really fun and unique way to take in the local surroundings. One of the first places I found to work was in an alley near our hotel in Taipei. It was a small, crowded, and bustling alley that was busy even in the rain. One of my favorite work spots was this place in Phnom Penh, where I could sit and look out at the National Palace just across the street. The wifi actually worked, the food was good, and the fans kept it relatively cool. The craziest place I worked on the trip was on the overnight bus from Hoi An to Saigon in Vietnam. 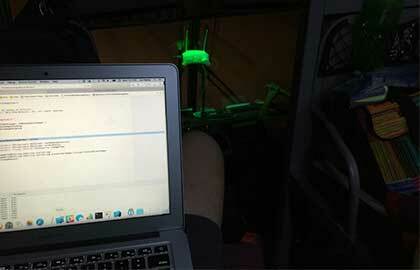 The bus claimed to have wifi (the glowing green router in the picture), but it didn’t work at all, so it was the personal hotspot to the rescue. The drivers chain smoked the whole 24-hour trip, and at some point in the middle of the night we hit something and blew a tire. It was an adventure to say the least. 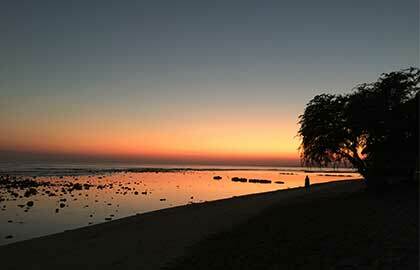 The most relaxing place I worked was on the island Gili Trawangan in Indonesia. Our hotel room had a pretty big veranda where we could sit and see the ocean right across the street. One morning I had a 6am conference call which I was not excited about, since I’m not really a “morning person.” I was rewarded with a spectacular sunrise. Pretty rough working conditions huh? The town Ubud in Bali was packed with cafes, so it was just a matter of picking a good one. One afternoon my daughter had reached her limit of walking around and just wanted to sit, so she drew pictures and I built a new feature. Finding good times to work presented another set of challenges, as there were several factors to coordinate. 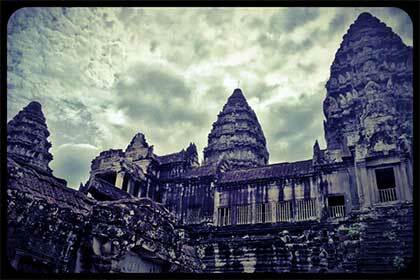 Since we did not have a set itinerary for our trip, we were able to be flexible with sight seeing and travel. If there was a pressing need for me to get something done, we could plan an easy day where I would be able to work. 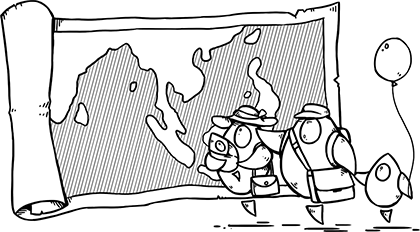 If it was relatively quiet with work, we could plan to do more sight seeing during the day. Most of our travel between locations we were able to schedule on weekends, or during times when it wasn’t disruptive. With a ten to twelve hour time difference, the only time I could catch up with people working in the US was early in my morning or late in my evening, so I would plan to check in first thing in the morning and right before going to bed. What I didn’t realize was that left me free to really focus on tasks during the day when everyone else was sleeping. One other unexpected benefit to the time difference that the client pointed out was that they were able to give me tasks at the end of their day, and I would typically have them ready by their morning - which was really helpful in meeting a tough deadline. We were able to coordinate a 24-hour development cycle between the US, Europe and Asia and really crank the work out. The time finally came for us to get the kids back to school and resume our normal daily lives. After a 28 hour journey home from Singapore and recovering from the inevitable jet lag, I will settle back in to Working from Home. But watch out, now I know how to use a headhunter’s blow dart gun.